These wedding flowers are simply stunning and are sure to make an everlasting impression. 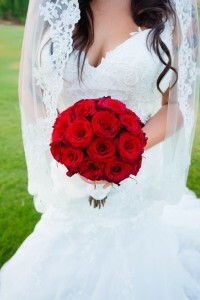 The bridal bouquet is made of long stemmed Black Magic Roses and the wrap on the bouquet is made of lace from the mother of the brides wedding dress! 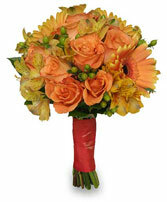 Call our florists to schedule an appointment to discuss the perfect wedding flowers for you! 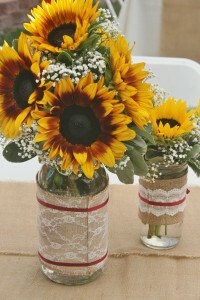 This arrangement in a mason jar consists of "Ring of Fire" Sunflowers and baby's breath and is accented with a burlap and lace ribbon. 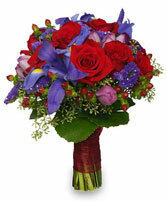 The price quoted is for the larger centerpiece alone. To make more of a statement you can add on smaller accent arrangements as pictured! 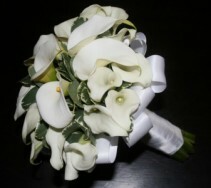 These classic all white flowers are timeless! 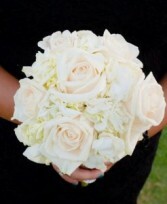 This bridesmaids bouquet consists of lovely white roses, heavenly white hydrangea, and the stems are wrapped in bridal satin ribbon. 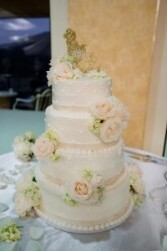 Flowers are the perfect finishing touch for any wedding cake! This cake is covered in clusters of white Hydrangea and white Roses. Is your big day fast approaching? 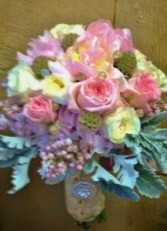 Call Willow Branch Florist of Riverside today to schedule your wedding consultation! 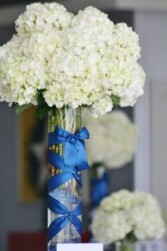 Beautiful white wedding flowers with blue accents. This bridal bouquet is made up of stunning white roses and dark blue delphinium and is accented with a decorative blue and white satin ribbon stem wrap. 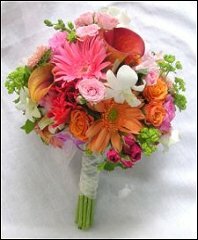 Give us a call to talk about the perfect custom wedding flowers for your big day! 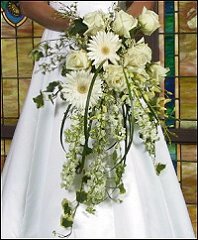 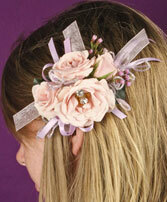 This more traditional bridal bouquet type continues to be a popular bridal bouquet type among brides. It is because of its unique design, the flowers seem to flow downwards, leaving a trail from the top of the bouquet. 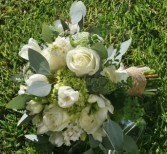 This type of bouquet goes way back but our florists often give a modern twist to it like adding brooches, beads or pearls to make these bouquets very up-to-date. 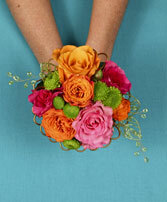 Rich jewel-toned flowers are arranged and wrapped in chic ribbon for a gift bridal bouquet that's truly memorable. 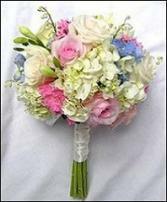 The modern, feminine composition is sweet and romantic, making it the perfect bridal bouquet for a jewel toned wedding. 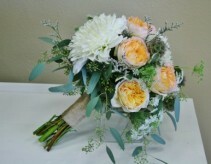 Call your local Riverside Florists at Willow Branch Florist of Riverside to schedule a wedding consultation.